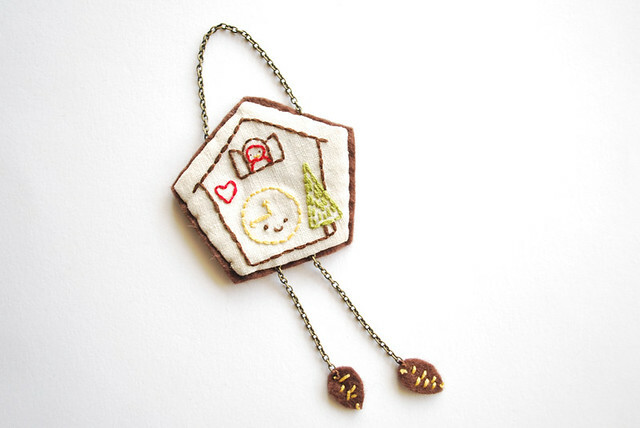 Welcome to the first day of Christmas Ornamentation! This will be three packed weeks of ornaments, leading right up to Christmas. That might feel a little late for you to still be making decorations, but it's not. Why? Because there's always room for adding ornaments to your tree, garlands, or just around the house. And better still, ornaments make wonderful last-minute gifts and present toppers! Today's ornament was inspired by the Cuckoo! pattern that I sell in my shop. This one is much, much smaller, and has some 3D details on it! 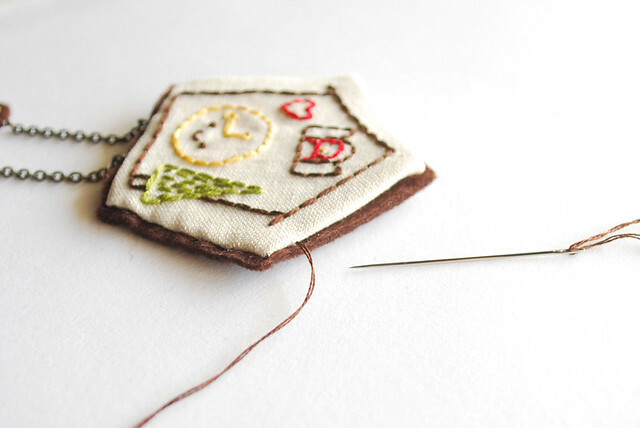 Begin by transferring the pattern for the clock body to your fabric, and embroidering it. Cut out the pentagon template from the PDF. Center the embroidered design within the pentagon, then cut out about 1/4 inch around the outside of the template. 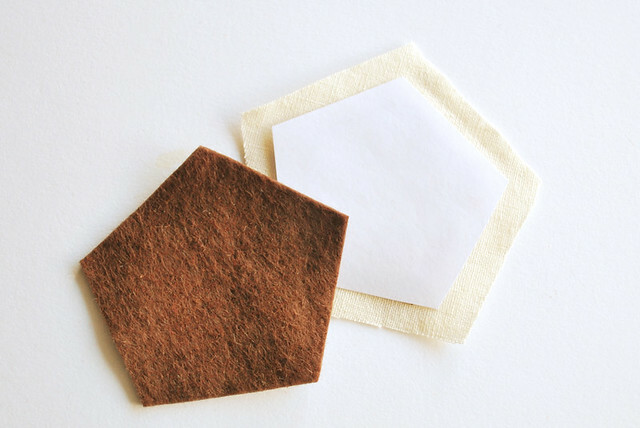 Cut a piece of felt the same size as the pentaagon template. Pin the pentagon in the center of the fabric piece, then fold over each edge and baste them down. A stitch or two at each angle of the pentagon will hold it. Secure the thread and remove the pin. Embroider the little lines on the felt and cut out the pine cones. 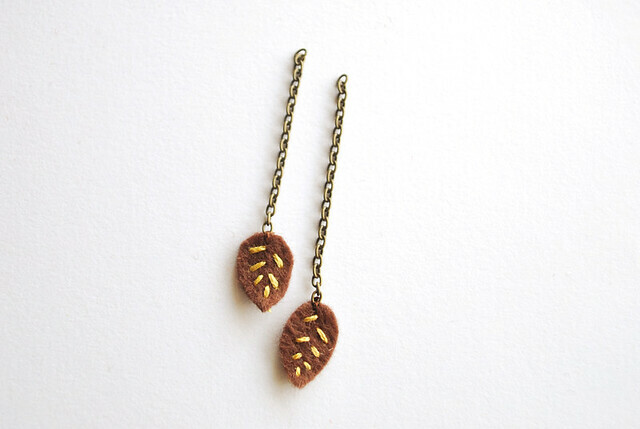 Cut two short pieces of chain (about 1-1/2 and 2 inches long), then sew them to the top of the pine cones. Stitch the chains to the bottom of the cuckoo clock. 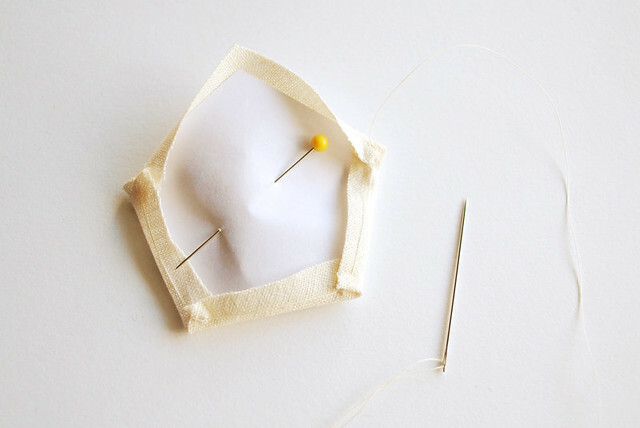 Sew the felt piece to the back of the embroidered pentagon. When you've made your way around 3 or 4 sides, carefully pull the paper out of the center of the pentagon. Finish stitching on the felt. 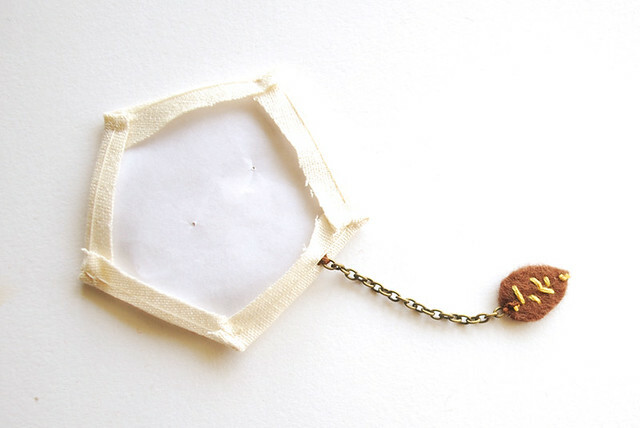 Add a piece of chain to the top as a hanger. You've got an ornament ready for the tree! 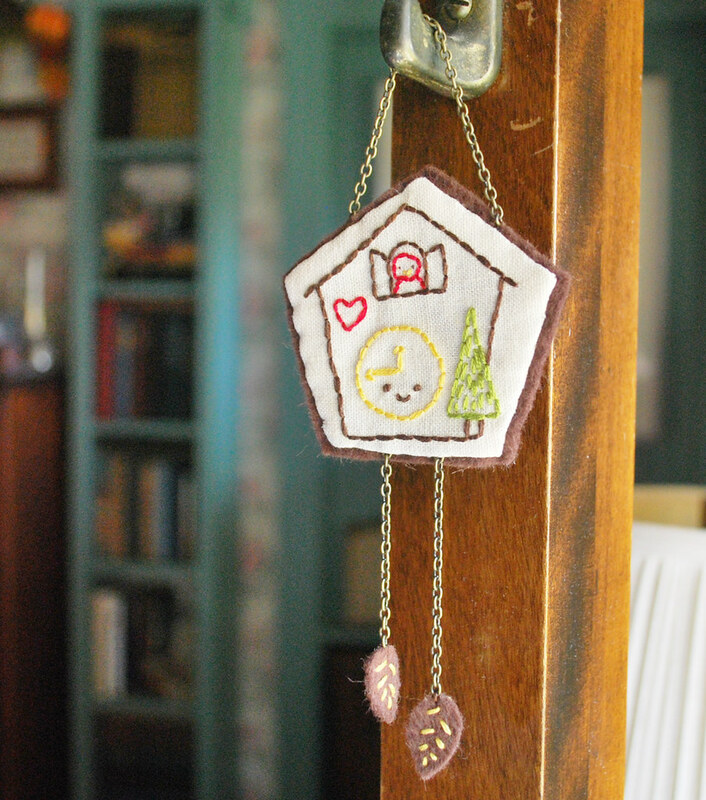 I've been making other little ornaments like this, substituting hexagons, and stitching on initials or other small designs (like my Advent Tinies). They are much simpler than the Cuckoo, and are fun to whip up for all of my family members! Don't forget, all this month you can link up with your own ornament blog posts. Share them here! Never a cuter ornament I have seen! 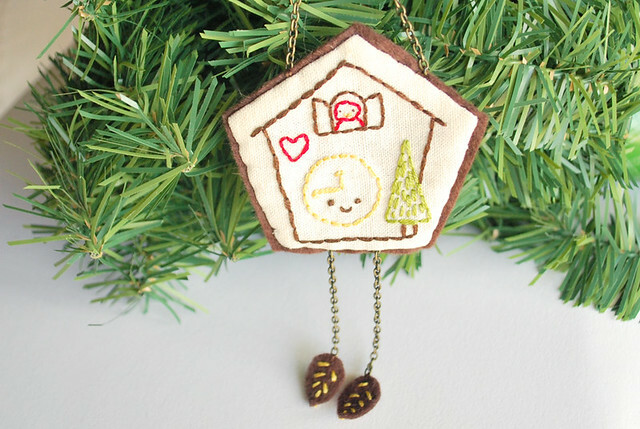 Thanks for including a tutorial with this, it's something I am adding to my ever growing Christmas craft list now! I love it ! I really do!! Thank you so much for this post. I want to let you know that I posted a link to your blog in CBH Digital Scrapbooking Freebies, under the Page 4 post on Dec. 05, 2011. Thanks again. oooo I just love this. i'm very excited to see what else you come up with mollie! This is quite possibly the cutest Christmas decoration I have ever seen! I love it! thank you!! this is so cute! All these ornaments you shared on your blog are so cute. thanks! 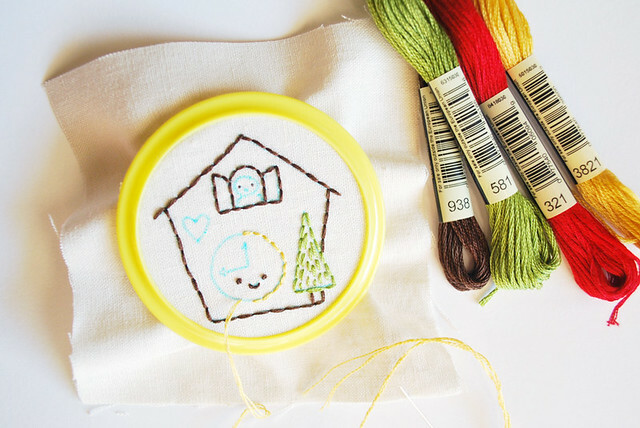 I just discovered your blog (through Feeling Stitchy) - and I feel like I just discovered needle Utopia! LOVE your goodness, and I'm starting on some cuckoo clocks TODAY. Thank you! I absolutely LOVE all your projects and tutorials. One of my favourite blogs, definitely. Muy original y sencillo de realizar, gracias por el tuto.